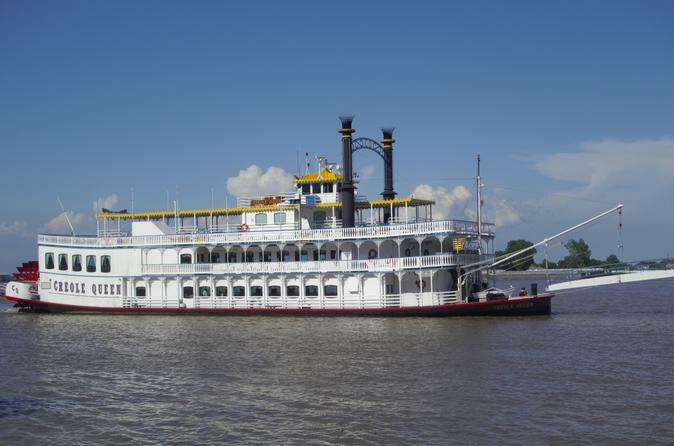 Take a 2 hour, 30 minute cruise down the Great Mississippi River aboard the Paddlewheeler Creole Queen. Enjoy a narrated tour about the battle of New Orleans in 1815 while taking in the sweet breeze and delicate waves along the river. For a 1-hour excursion stop at the battlefield of New Orleans guided tour and talk by a National Park Ranger. Delight in a cash bar and/or a satisfying Creole lunch option available on the boat while viewing the famous French Quarter and Port of New Orleans from the river . Once you receive your ticket online please bring your photo ID and voucher down to the Ticketbooth located on the Riverwalk Dock (2 Poydras St. New Orleans). When the voucher is successful redeemed from the reservationists, you will be directed to board. During the cruise you will hear a narration from an expert, local guide who loves New Orleans and its history. As you sail learn about the great Battle of New Orleans, river lore, and historical landmarks along the river. Then stop at the Battlefield where you can visit a gift shop, the Chalmette Monument, the Malus-Beauregard House, and listen to the Park Ranger give a more in-depth narrative about the Battle. Return to the vessel and ride back down river to enjoy more stories and beautiful river views. There are two boarding times for this cruise that last 30 minutes before cruising time. Boarding times include: 9:30 a.m. to 10 a.m. and 1:30 p.m. to 2:00 p.m. Cruising times include: 10 a.m. to 12:30 p.m. and 2:00 p.m. to 4:30 p.m. Cruises are free for children five and younger. If you are interested in indulging in the Creole Lunch on board please call (504) 529-4567 to add this option. Menu items include: red beans and rice, jambalaya, Cajun Seafood Pasta, Creole Chicken & Andouille Sausage Gumbo, our signature White Chocolate Bread Pudding with Whiskey Sauce, and more!